Jack’s 94th B-day, New Baby Lainey, Sister Visit, Big Hill Trail Maintenance, and RV winterizing. First, I will apologize as this post is going to be all over the place as you can tell by the title. It will end with a little piece of RV advice, but sometimes life is too exciting not to share!! My father-in-law Jack turns 94 today. Bob, Ruth (Bob’s mom) Taylee (my daughter) and I, went to Rapid City to celebrate with Bob’s daughter, Halie, son-in-law, Matt, grandson, Kieran, and new granddaughter, Delainey (pics to follow). Jack is a World War 2 veteran that was a staff sergeant in the Army Air Corp, a gunner and a radio operator on a B-25 in North Africa. He was shot at numerous times and lost one of his eyes as a result. Jack is one of the best humans I know on earth and I am so grateful for each visit with him. Happy Birthday Jack!!! Thank you for teaching your son how to be equally great. Welcome to the world baby Delainey Lou Anderson. I could go on and on about how wonderful she is but I’m sure you will be able to see that for yourself. This is Bob’s second grandchild and we love her to pieces. Her brother Kieran isn’t convinced yet that his world hasn’t fallen apart, but he loves her too and was excited to transform into a super hero at the end of our visit. Baby Lainey has to have surgery in a week or so. Pray that everything goes perfectly!! My sister, Shana, and brother-in-law, Doug and kids also came to Lead for the weekend. They were staying at Guilded Mountain at a friend’s cabin. The cabin is beautiful and rentable for winter or summer fun! The owners are fantastic and this is the perfect getaway for a large group or family getaway. We met them for some Gator exploring and found a cemetery that I didn’t know existed which came from the town of Terry (you can see the red run on Terry Peak from the cemetery and read about this wonderful town in it’s glory days by clicking on the link). I also got to kiss my nieces and nephews during my short visit which is my favorite thing to do. On a totally different subject…yesterday, the Black Hills Nordic Ski Club had a trail clean up day. Prior to a couple of years ago, I never wondered how the great bike trials and cross country ski trails were created or maintained-I was just happy they existed. That was until I helped build some new bike trails in Sturgis and found out just how hard it is to bring recreational activities to the Black Hills, both physically and logistically. Yesterday, I got to experience the same thing with the cross country trails at Big Hill. Do you see that log crossing the trail? It was big and heavy and removed by Bob. He has been cleaning trails for years, along with a hand full of other ski enthusiasts. It was a beautiful day and although we are not finished, we made a dent. If you don’t know how wonderful Big Hill is-go check it out. It is great for hiking/biking in the summer and cross-country skiing/snowshoeing/fat biking in the winter. *Please note: Dogs are discouraged during ski season as they disrupt the grooming process on the ski trails. If you have a beloved pet, they may be happy to shoe show with you on those trails and there are plenty of unmarked hiking places in the area. To get there- drive up Tinton Road until you come to a big parking lot on the right. Park in it and cross the gravel road to the trailhead sign. The top of Big Hill has a shack for warming up- BONUS. If you are a beginner, go with someone who knows where they are going as there are several miles of trails. Here is a map but please don’t go skiing alone if you are a novice skier. The trails are long and far from the parking lot with limited cell phone service. If you are a beginner or want to try skiing, message me and I will go with you. Also, consider joining the ski club. Your dues help pay to maintain these trails as all work on them, including grooming, is volunteer. Here’s the thing though- as you can see on step 7, pour RV Antifreeze in all P-traps, winterizing requires you to handle antifreeze and know what a P trap is. Now, this girl is not touching anything resembling antifreeze as it is POISON. A quick google search offers 317,000 results on the words antifreeze and poison. It only takes a few teaspoons to kill animals, so in my opinion, this job is best left to the professionals. What if I accidentally confused my cup of coffee with my cup of antifreeze? Disaster waiting to happen. Now, on to the P-trap. For your reading enjoyment, I have linked what a P-trap is here. If you take the liberty to actually look at that page, one word should stand out to you- sewage. So to summarize the glamorous winterizing requirements…poison and sewage, no thank-you!! Dakota RV is our one stop shop for all Goldie’s needs. They are located conveniently right outside of Rapid City and will handle all your poison and sewage needs! The friendly staff also recommended that we run our generator one hour each month of the winter, which will also keep the batteries charged (apparently batteries won’t freeze if they are charged). We do store Goldie in an enclosed storage unit during the winter but that will not keep her from freezing in South Dakota. Also, my mom told me to put dryer sheets in the RV to keep mice away so Goldie is covered in them. That’s all the RV advice I have for now, I will let you know if these tips worked or not in the spring time. Thank you for taking time out of your day to read my scattered thoughts and take another second to hug your family because they are probably pretty great too!! As you can tell, I have already digressed from the RV theme to talk about my last non-RV trip to Martha’s Vineyard (welcome to my mind/personality). As you can see from the photo, it was windy and cold the first day but the wet spot on my jeans is not rain, but coffee- daily occurrence for me! Although I was intrigued with the Vineyard (as locals like to call it), I didn’t intend on going their over Labor Day Weekend. Bob and I planned to use our frequent flyer points to fly to Houston to see our new baby niece, Adley. *Daily struggle not to kiss her sweet face!! Unfortunately, FaceTime has to be enough for now. To make a really long story shorter, United (free trips with this card, but it is $100 per year), would exchange our tickets but not refund them as the airport was officially open. Houston was still only accessible by boat, however. In order for the trip to happen, I officially became a travel agent for two days booking flights, motels, cars, ferries, air B &B’s, and activities as my real travel agent was on a trip to Europe and inaccessible for my personal emergency. Jenny, I loved you before but I now value you even more than I did. Being a travel agent is not for me, but I managed to get it done. Night one– Drive to Gillette, Wyoming and spend the night at the Holiday Inn Express This hotel was literally amazing for a small Wyoming town. We even survived/slept through the teenage girl soccer teams next door. P.S.-flights from Rapid City were blocked. Day one– Fly from Gillette (GCC) to Denver (DEN), Denver to Washington DC (LAD), Washington DC to Warwick, Rhode Island (PVD). Gillette’s airport has free parking. Yay!! Make sure to eat at Root Down in Terminal C in Denver if you have a long enough layover. It is a normal restaurant with great food. We rented a small car from Hertz at PVD, which we purchased with points. They did require us to pay for additional drivers so if only one person in your party drives, have them sign up for the car and relax in the passenger seat. Renting a car is often a headache, so I suggest pre-registering online and signing up with one company for their deals. Frequently they offer upgrades for customer loyalty. After finally (this actually only took approximately 15 minutes but my bedtime was creeping up, even with the two-hour time change) getting our car, we drove the 80 miles from PVD to Woods Hole, Massachusetts to board the Steamship Authority Ferry. I found the website to be less than helpful, but the customer service via phone was. If this is your first trip with a car, just call them. We scheduled our ferry for 9:45 pm, but made it to Wood’s Hole at 8:44 1/2 and they let us on the 8:45 ferry- thank God. Unfortunately, the drive was in the dark, both ways, because it looked as though it might be a very scenic route. So sorry for the lame ferry pictures, but I was exhausted both times. If it’s nice, you can sit on the deck outside and they do sell beer, wine, and snacks as well as offer TV on the upper deck. The ferry experience was an easy one once we figured out where to go from/which ferry to use. I chose The Steamship Authority based on a few factors: location, length of ride, and customer reviews. We finally arrived in Oak Bluffs or Vineyard Haven (can’t remember as they ferry to both and are very close to one another) and drove to our very first Air B&B experience. The drive was approximately 30 minutes, in the dark, to a remote location-insert scary music here- but the Waze app worked like a charm. Thank you Pina for that tip!! It even worked on the ferry. I am now exhausted from reliving that experience and writing this post so I will continue next week with Martha’s Vineyard- Part Two! Happy reading and see you next week. *The Vineyard does have taxis which would make the ferry experience easier, but the island travel much more difficult and expensive. *Since this is officially a RV blog- I don’t suggest driving a RV to Martha’s Vineyard. They do have spots to camp, but the Ferry process will be harder and there are A LOT of tourists. The roads are small island size and easy to navigate with a normal sized car, but may bog down traffic in the RV. Also, we didn’t see one RV on the roads or ferry which pretty much means, don’t do it. Welcome to my blog!! I am writing this more as a journal, but also to provide helpful tips for those of you beginning your RV journey for the first time. Buying an RV is overwhelming and I hope to decrease the anxiety of researchers like me by providing tips, that I googled extensively, prior to purchasing Goldie. Pictured above is my 13 year old son, Bill, who obviously is excited to be on social media with his mom! The class A is ideal for travelers who spend the majority of their time away from home or want to make the RV their permanent home. This RV can be customized to fit any lifestyle and is the closest representation of a real home. The used versions start around $100,000 so the class A requires commitment. Class B is for the adventurer, the RV’ers that spend more time outside of their RV than in. The price point for the new class B is around $100,000 with a large range of used options. The van/RV model is best suited for two or less people as it is very compact, but does include everything you need to sleep/shower/eat on the road. The couch will often convert into the bed and the toilet may be combined with the shower. This option is not for those that require the king-sized plush, pillow top bed to get a good night sleep or for the claustrophobic. The goldilocks version- not too big, not too small. The class C comes in at the $120,000 range for a new version, but you can easily find a gently used version at a fraction of the cost. 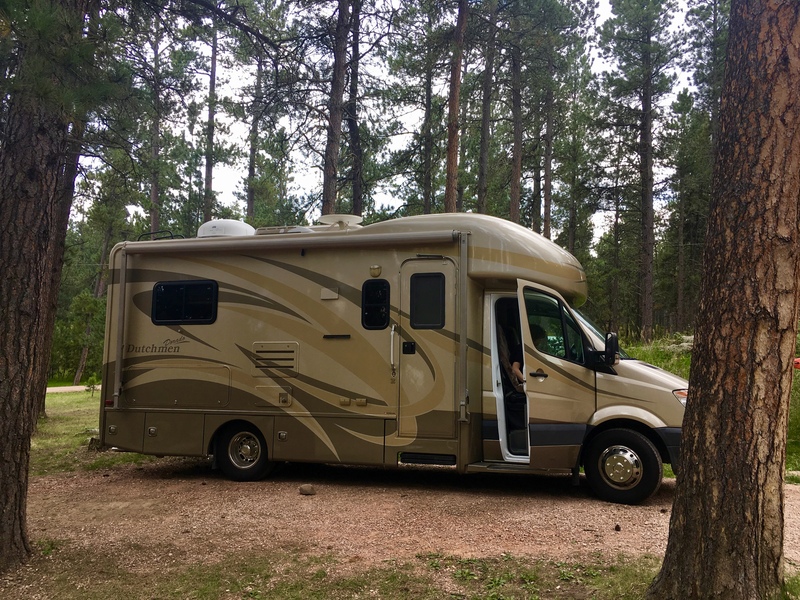 We chose the class C (Goldie) over the class B for space reasons, but we are the fourth owner of our RV as the other owners traded up for a larger model-purchased at Dakota RV. Our RV is only 24 feet long, but accommodates 1-4 sleepers as well as ample storage for all of our toys. We have only been on two trips with Goldie but she has performed well. I will have a full review of the campgrounds, including where to eat/what to do in the future. Future posts will also include what I bought for the RV, how to set it up, what to do when you blow the fuse on your first trip , where to get the best cup of coffee, etc. Stay tuned! Thank you for reading!! Feel free to post any questions you have.